If you thought growing orchids was all about the flowers, you’ve never taken a look at the Ludisia, or jewel orchid. This unusual orchid variety breaks all the rules: it grows in the soil, not in the air; it likes shade instead of a sunny environment; and it gets its good looks from the velvety leaves it produces instead of its flowers. If they’re so different, then what are jewel orchids? They are one of the simplest orchids a budding grower could own. If you can grow a begonia indoors, you can be successful with growing jewel orchids. Once you search for jewel orchid information, you’ll find a number of surprising differences. Jewel orchids are best known for their red and green textured leaves, which have a deep, velvety feeling. These plants do produce white or pale yellow flowers, mostly during the winter or very early spring months. Ludisia developed on the rain forest floors, so they don’t like a lot of natural light. In fact, too much sunlight can wash out their distinctive leaf colors. 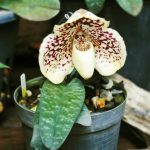 You can grow jewel orchids indoors as a houseplant, and it’s easily propagated by breaking off a piece of rhizome and rooting it in regular African violet soil. When you care for Ludisia jewel orchids, forget about everything you’ve learned about growing other orchids. These are terrestrial, which means they like to have their roots in some form of soil. A commercial African violet mix works perfectly with these plants. Ludisia orchid care means putting your plants in a spot where they won’t get a lot of temperature fluctuation, but will have a good amount of humidity. Surprisingly, the best room in many houses for this plant is the bathroom. The steamy air and fluorescent lights are exactly the right environment to grow the deeply colored leaves without fading, while keeping the plant moistened without having to worry about extra watering chores. You may not be worried about producing a huge crop of flowers, but jewel orchids still need feeding. Give them commercial orchid food according to the package directions, feeding them once a month.